We’re diving head first into the Matrix for this week’s episode of the podcast! This week’s episode of the podcast is all about The Matrix trilogy and it’s properties! 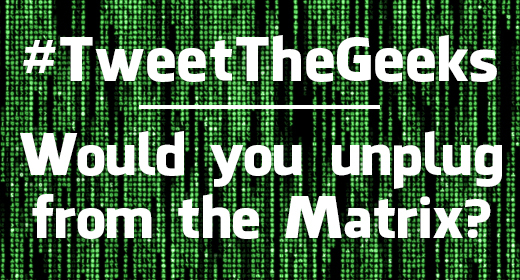 So, this week’s question: Would you unplug from the Matrix? Let us know, and we’ll feature you on the this week’s epsidoe of the podcast! @JustUsGeeks Plug it in, plug it in. @JustUsGeeks well let’s say this life IS the matrix, then no. Id stay. That steak is too delicious.